The old Dog is getting rather colorful these days! Last Fall when I heard that the fertile mind of Brant Richards was designing a fat bike fork for On One, my interest was piqued. Would it be something I could make use of? I knew the prices through On One were reasonable, so I was hopeful. I found out later that it was definitely something I could use. Straight 1 1/8th steer tube, rear brake standard for the fork, and all carbon fiber light. The availability was sketchy earlier in the Winter, so I waited until a new shipment dropped to On One and then I pulled the trigger. It took almost two weeks from the UK, but I think the wait was worth it. The Snow Dog's original Enabler fork weighed in at 1050 grams and the replacement on One Fatty Fork weighs 590 grams before I cut the steer tube! That's some serious weight reduction right there. I have to dial in the front brake a bit more, but a quick ride showed me that this fork does have some compliance, so it promises a decent ride. Obviously, the front end feels a tad lighter, but the handling seems really good yet. We'll see once things get nasty and I have more time on this rig. This isn't the end of upgrades though, just the beginning. Next up will be a drivetrain redo with a move to 10 speed and possibly one of those ginormous 42T add on cassette cogs so I can extend the range of the 1X set up. I don't see me going to a front derailluer anytime soon on this, maybe never. There will be a new crankset as well. Possibly something that fits a 30T or maybe one of those crazy SRAM cranks with a 28T drive ring. A clutch equipped derailleur is a must. I'll live with the wheels for a while, but those will get replaced sometime with something lighter and nicer. No hurry there though. I've a feeling a ton of new options are coming soon that will satisfy that itch. Often times I find it sad, ironic, and downright stupid how folks get things either twisted, or just don't understand what it is they are talking about when it comes to cycling. Also, I know some of the pundits out there are just trying to attract attention for their writings so (a) their employers get more "hits" and/or sell more issues, and that (b) many folks are just being negative to troll up reactions. Most of the time I let stuff like the following go, but I figured that in this case it was either blatantly a troll, or maybe the author really thinks this stuff. Either way, here's my reaction to this "Bicycle Times" issue #29 article under the heading of "Ask Beardo The Weirdo". Under the thin veil of answering a reader's question, "Beardo" says this about gravel grinding: "Also, let's also,kill the gravel grinder nonsense term". and then follows that up with some movie related gibberish which leads to this,"People have been riding road bikes on unpaved roads for as long as the bike has been around." Ha! It's always the same ol' ruse whenever someone wants to criticize "gravel grinding" and related hardware to do that with. The "Just ride any bike" crowd, and that ilk seems to be a group that smacks of self righteousness and is so short sighted as to think that bicycle specialization is somehow evil, bad, or undesirable. I mean, if this is the case, go ride a Madone at the next cyclo cross race in Portland. Right? Because "people have been riding road bikes on unpaved roads for as long as the bike has been around." Yeah....that'll work! "Beardo" then makes a salient point. That being that any bike can be ridden on a gravel road, but he adds that "even that skinny-tired roadie bike will be fine with reduced speed and enough air in the tires to prevent pinch flats." Right. Obviously Beardo hasn't ridden much of the over 69,000 miles of gravel roads in Iowa. Not saying it cannot be done, but I am saying there is a much better tool for the job. Just like riding a road bike in a cross race isn't impossible, but it isn't going to be all that fun either. See what I mean? There is a better way for gravel, so why is that such a bad thing? Then he goes on to finish by stating that "...a bike built specifically for that use, (gravel road riding), would probably make you happy." Thank you Captain Obvious. Nothing could be further from the truth. It wasn't made up by companies, or marketing wonks, it was coined by roadies. Road cyclists that trained on gravel roads during the early season to get better fitness, test themselves against the winds, and to "grind out the miles". This type of riding came to be known by these road cyclists as "gravel grinders". They rode the old steel bikes with tubular tires and friction shifters. Generally they rode in the Spring before the roads were maintained, so pinch flatting wasn't as bad an issue. Anyway, that's where the roots are from of gravel grinding and where the term came from. When we started these grassroots events in the Mid-West, we called them "gravel grinders" due to that history. The idea spread, and well.......now magazine writers that don't understand the term spout off about it. But you don't have to be misinformed in kind. Finally, I'd like to wish all the Dirty Kanza 200 riders a great time and a fantastic ride. It's a beautiful course where you probably won't see any road bikes, due to the flinty rocks, but you will see plenty of gravel grinders! Keep the rubber side down and have a great weekend on whatever kind of bike it is you ride. My son and classmates. He's second in from left in the middle row. Life is full of little markers. We have our birthdays, wedding anniversarys, deaths, divorces, and the first time we kissed someone. Yesterday was a milestone for my son, and......well, for me also, I suppose. My son was promoted from 5th grade. Next year he goes to Middle School. I and his aunt attended since they had the ceremonies just after lunch. Great job of scheduling so my wife, who works five days a week, could attend. (sarcasm intended) Anyway, at least someone was there for him. He's worked hard and this didn't come easy for him. I suppose a 5th grade promotion ceremony could be seen as somewhat goofy. We never had such things when I was young. You simply walked out of school in the elementary building one day and walked into the Junior High School in the fall. No fanfare, well.......unless your Grandma gave you an embarrassing kiss and pinched your cheek during the Summer between semesters. It wasn't seen as a "big deal" back then. And maybe that was a problem. You see, I never thought of school as being "important" then and for a long time afterward because no one seemed to care, or make a fuss about it. Now we do, and I think that is the better way. Before all the festivities I went out for a brief ride on the Milwaukee Bicycle Company single speed. The greenery has been fast in its advance since the warm weather broke and it is full on Summer-like jungle out there already. Mosquitoes are busy looking for likely subjects, but thankfully, since it has been drier, their numbers are not what they could be. The single track was littered still in last Fall's detritus and the contrast between new and decay was sort of jarring in places. No matter- the grip levels were up and I was flying along at pretty good speeds when I felt the need to. It was a good, twisty-turny ride in the woods, which I had all to myself once again. However; the promotion ceremony scheduled for just past noon and the fact that I needed to install the upstairs window air conditioner meant that I had to cut things back on the riding time. Gotta keep the peace at home! I was just glad to have gotten a little more dirt time in on primo trail. It was fun, and I could have stayed all afternoon, but it wasn't to be. That was okay too, since I had a bit of a milestone to mark later. It was a good one to see pass too. It ain't much, but it gets the job done! Here's my Xtracycled Schwinn Sierra circa 1987 or so rig that I use for errands. It really isn't anything all that amazing, excepting that it is maybe the most versatile bike I have in the stable. It hauls about anything I've a mind to try to strap to it, but that's not really what makes it so useful for me. It is perhaps the only bike, aside from my rat-rod fixie Raleigh, that I would leave unlocked anywhere around here. The thing is too ungainly, ugly, and weird for most folks here, so it provides me with an easy solution to just hop on and go down and get some milk, a pint of beer, or whatever. I have Ergon pedals on it, which I've used barefooted, (although I don't recommend doing that regularly! ), so no special footwear required here. I don't hardly ever wear a helmet when I ride it, so no special head gear required. It's got some minimalistic tail lights and a head light, so I can go out at night anytime I want to run and do something quick. So why would I want to change that? Oh........I dunno! Maybe I'm just being a bike nerd. I really should just leave well enough alone. This thing is nearly maintenance free, I got the donor bike for free, and the Xtracycle kit I traded an old touring bike for. I bought some cables and housing, used my old rear wheel from my '92 Klein Attitude, and bought a rear tire for it for under $20.00. The front tire was a cast off from my buddy Jeff Kerkove, who was sponsored by WTB about ten years ago. It's an "EpicWolf" tire, by the way. The model that Specialized made WTB change to "ExiWolf". So, the old Xtracycle doesn't owe me a thing, and it just keeps on keepin' on. Still, there are times when I feel like a newer, slicker rig would get me to think about using a cargo bike more. Maybe a "real" cargo bike like the Big Dummy, which I could swap my stuff over to and what I don't have, I could source from the parts bin. Would it really be "better"? I suppose it would function better, but then I would have a bike that I wouldn't feel comfortable just parking outside the convenience store unlocked either. Hmm.............maybe not so convenient? I would have a rig that would handle heavy loads better, with better brakes and better stiffness. But I don't hardly ever use my current rig in situations where those things come up. Maybe I don't need that level of bike? And then if I do go with a Big Dummy, I have an old, unloved Schwinn Sierra. That's not a good thing, but you know......I suppose I could find a good home for it! This road is on the Masters Program route. The good news is that the entire Trans Iowa Masters Program route has been cue sheeted and is there if you want to down load those cues. The bad news, (if you are averse to dealing with challenges), is that I have not, and probably won't get around to, reconning anymore of it than I have on-line or the tiny amount of it I have driven. That means that if there are roads out, bridges out, or construction, you'll have to deal with it. I think you folks can handle it. Now with that said, here are some notes on the course that those of you who may take this route on might find interesting. The first sector is new until you get to the high school on the East edge of Hawarden where T.I.V1 and V2 started. Then it is all V1's route into Orange City. With a bit of "transfer" in Orange City, the route goes to V2's path until you get to Algona. From Algona to Osage the routes of V1 and V2 were close to the same. All of this sector of the Masters route is fromV2. V1's route deviated notably going from Algona to Forest City. Out of Osage until the route gets midway into Howard County the route is V2. I wanted the route to pass by my family's homestead just East of "Maple Leaf", which was a tiny town at one time. Going into Cresco and up until a few miles before Decorah the route is from Trans Iowa V4 running it backward. Trans Iowa V3 and V4 both left Decorah going out on Quarry Hill Road just beyond the bridge over the Upper Iowa River. 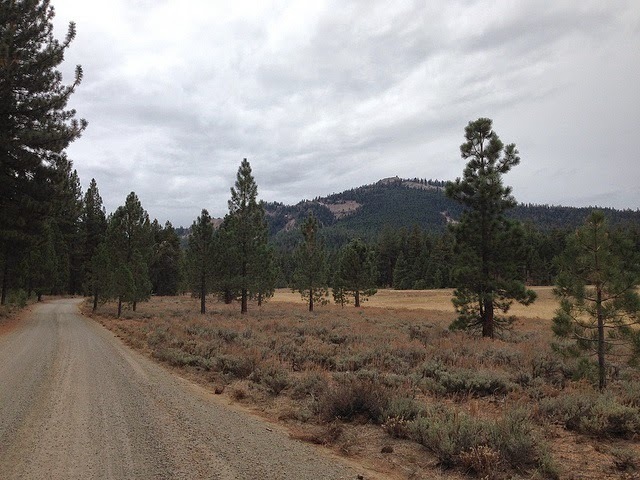 You will cross the "start line" of both those Trans Iowas with 47.87 miles to go to the end of the Masters route. The Masters route follows T.I.V3 until the intersection of Ellingson Bridge Dr and Iverson Bridge Road where the rest of the route is all new until you reach Lansing Iowa. Okay, and with that I am mostly done with setting up the Masters Program. NOTE: This route is not staying up past August 31st, so if you think you'd ever want to ride it, download it now by going here. Find the pages dedicated to the cues and get it. I am not going to ever publish this route again after August 31st when the Trans Iowa Masters Program will close. Don't ask me later, because when it is gone, it's gone for good. Here in America it is Memorial Day. The day set aside to remember those who served and gave all for this country. I hope you all take a moment to remember those who served and take advantage of our opportunity of freedom and exercise it in a positive way today and the rest of the year. Happy Memorial Day from Guitar Ted Productions! Yesterday I slept in pretty late. Till around 11am! That's unusual for me, but I have been pretty run down of late and I guess I needed the sleep. So I waited until after lunch, (which was really breakfast, I suppose! 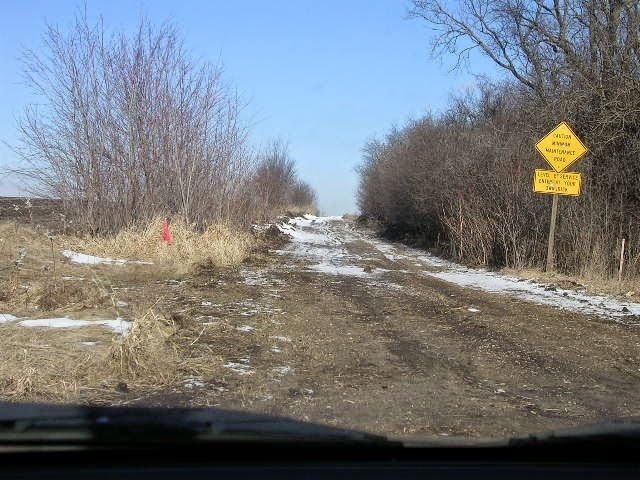 ), to roll out and go in search of another of Black Hawk County's B Level Maintenance roads. The target was a road near the Northeastern border of the county. The road was shown on many maps and is part of Pilot Grove Road in the last mile before it reaches the Bremer County line. I'd been out that way partially, but not as far out there as this road was. I decided to make a big loop out of it by going up to just Southwest of Denver and then cutting across on 270th in Bremer County. I then went a mile South after a while to Marquis Road where it is paved so as not to miss the exit where it dumped out to the county line, which is Marquis Road. Unfortunately, I didn't find the Northern entrance, and I had a sneaking suspicion that it had been plowed under and was part of a farmers field now. I rode around to the East and South and then back West to see if I could find the Southern entrance to the road, and I did, but it was obvious that it had been decommissioned and was back in the hands of landowners. You can make out the old road bed from the South side of the old B Road. It was a bit of a disappointment as I had been hoping I could bag another B Level road in Black Hawk County. Those types of roads are rare in this County and in this area, but go South of here and you can find loads of them. Well, with that done I turned back West and South to get myself back home again. The wind had come up and was blowing strongly from the Southeast, which was okay when going West, but was a bit of a struggle when going South. To make matters more difficult, the entire area up there is flat as a pancake too, so you have to pedal every inch. No coasting! It was very dusty on the roads and also in the fields as well. I saw a couple of "dust devils" while I was riding. These aren't really a very common thing here, but occasionally they form. With the strong winds, they were being pushed along a pretty fair rate of speed. I was on a collision course with one when it hit the ditch and was upset to the point of dissipation. Dang! I was wondering what it would have been like to hit one on the road. It ended up being a three plus hour ride. Maybe over 3 and a half hours total. Whatever it was, my legs were shot! A good training ride for Odin's Revenge coming up, perhaps, but not so good for finding the B Roads! Here's the latest on the Masters Program for anyone out there wondering about this. Okay, the cues for the "First Semester" and the directions for the "Mid-Term" have all been posted here. You will note that the cues are arbitrarily broken up into "quarters", which approximate 1/4 of the distance for each "Semester". You can print those off an reformat them any ol way you see fit, but that's how I am presenting them. I used the classic Trans Iowa cue formatting, so anyone that has done a Trans Iowa in the last four or five years should be familiar with the cue formatting. A special "Mid-Term" section refers to the small section of truly off road trail through Pilot Knob State Park. There is a small map and directions for reference. A note: If you should find the opening to the trail too difficult to locate, simply follow the paved road through the park, but please be aware that it is much longer and has more elevation gain! The "Second Semester" will get posted over this weekend holiday during my down time. This will take you from the East end of Pilot Knob State Park to Lansing, Iowa. It will be split into quarters as well. This section is slightly less mileage but will have far more difficult terrain, especially the last quarter! The Singular Cycles Buzzard was a bike build I had been dreaming about for quite awhile. Ever since I had gotten the chance to try a slack angled, short stayed 29"er, I felt as though there was something to the idea. I needed to have something like the Buzzard to test the idea out long term and see if I was crazy, or crazy like a fox. Mountain bikes were originally made to be capable going down hill at a high rate of speed, be durable, and to take you places you couldn't get to easily, or quickly by foot. The first mountain bikes of the modern era were all about exploring, adventures, and being durable and reliable enough to get you there and back again. Then racing happened. Suddenly everyone wanted to be like Tomac, Overend, or Furtado. Flat, long stems, big saddle to bar drops, and butts in the air. Go fast or go home. Then mountain biking found "freeride", down hill, and all the extreme stuff. XC racing was dying, then 24 hour racing perked things up, but you had to have a dual suspension device. Along the way, just riding a mountain bike for the adventure was lost. Then some things started coming together which has brought mountain biking full circle, I think. Things like wide rims, fat bikes, 29+, stable, slack geometry, and advancements in wheel size and accompanying geometry to make it all play nice. Bike packing, Tour Divide, and the whole adventure deal has come back around. It's a "perfect storm" of sorts that has produced bikes like the shorter travel 29"ers, 29+ bikes like Surly's ECR, the B+ idea, and bikes like the Buzzard. But the Buzzard is a "play bike", right? Well.....that's the perception by many. However; I am thinking my experiences are pointing to a newer, and at the same time, old throwback version of the classic mountain bike. The Buzzard can climb. Yes.....you have to adjust your climbing style to being "active" and not just sit there and spin. But it does climb well. Obviously, it descends really well, and with those shorter stays, it can do wheelies, and big moves rather effortlessly. With modern frame bag set ups, you could bike pack and do longer adventures easily. It is a simpler bike than a dual suspension rig, and with the big Velocity Duallys, it makes you traction and comfort issues smaller in one fell swoop. Lots of big gravel adventures are happening this weekend and in the next month some big events are going down. I am working on deciding what to ride for Odin's Revenge. I can do the Fargo again for sure, or the Black Mountain Cycles rig, which may be lighter, or the new Tamland. I could even do something ridiculously stupid and try a single speed Gryphon. I just have to choose and start training on it. Saturday will be a longer ride on whatever it is I choose, so hopefully I feel good and I can pile on some miles. I also need to ride some hills. Odin's has a lot of those to tackle! Plus I am hearing that there will be a lot of dirt this time. Like up to 30 miles of a 170 mile course. Crazy! Well, it's a big holiday weekend here in the US and I hope everyone takes the time here to say thank you to a veteran. Yes- it is fun to go ride bicycles and be with family, barbeque, or go fishing, but for the sacrifices of the veterans past and present, we wouldn't have that privilege. Have a good weekend and be safe, ya'all! Last week I wrote about how the Buzzard's Reba fork just didn't have enough clearance around the big On One Chunky Monkey/Dually set up. (See here) Well, here came a new fork via UPS on Tuesday and yesterday I mounted it and took off for the woods north of town. Loads of clearance to be had now with the new combination. I can probably put my thumb in between the brake arch at any point around the top of the tire now. No worries in terms of tire contact with the fork anymore. The Stage is also a 34mm stanchion fork, which is stiffer than the old Reba too. I can feel this while cornering, and when pushing the front end hard. The whole package just lifts the fun factor of the Buzzard to another level. The Q-Taper axle works well, and I didn't need a brae adapter to run the 185mm Shimano rotor either. Nice. Those big ol' tractor tires on the Duallys also make for a plush ride. I could tell I was erasing a lot of the trail chatter just with that part of the bike. In combination with the Stage fork, I felt like I had the best tracking wheels since I tested the Diamondback Sortie Black a few years ago. It was almost dual suspension like on the Buzzard, but then I'd get thwacked up the backside by the seat by a trail obstacle reminding me I was really on a hard tail. So, I am riding along in the woods on a nearly perfect day with nearly perfect conditions and I see a rather large bird take flight ahead of me. It was obscured by a large tree, and for a brief moment, I thought it could be an owl, as I could see that its wingspan was rather long. However; the bird veered to the right and I saw it light on a branch. Looking at it I thought it may be a turkey, but suddenly I saw that it had several of its kind accompanying it. Turkey Vultures! Or in other words- buzzards! Here I was riding a bike dubbed the "Buzzard" and I was riding right underneath some trees full of real buzzards! I'd seen these birds a lot here in Iowa, but never in the woods. I surmised that they were enjoying the cooler air under the trees while the Sun rode high in the sky and had heated up the air well into the 80's. Well, the Buzzard I was riding wasn't flying in the air, but it was flying down the single track, and it did a great job of that. I think it is a very capable design for single track and with time, I can see where this bike will lead me to learn a few new things. I'm pretty pumped about it now, and that latest piece to the puzzle is what has unlocked the door to the potential this bike has. So- How's That Working For Ya? Okay, it has been two and a half months now since I first rolled out on my Tamland Two gravel bike. I've done enough rides in enough conditions to have formulated an opinion on the design. As I stated back here, I will do my best to call out the warts as well as the beauty marks on this rig. Geometry: The entire reasoning I have for a specific "gravel bike design" centers around the geometry. 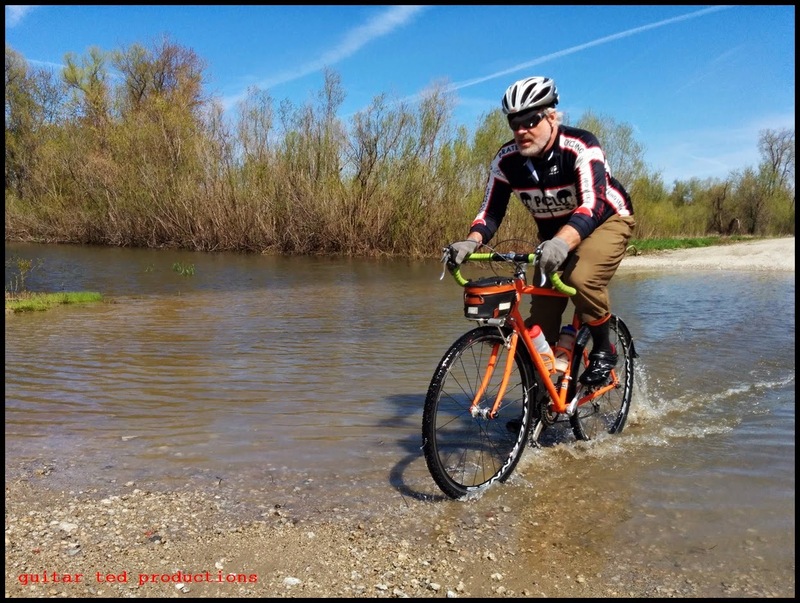 Essentially, I think that a "gravel road" and "road" bike should have some things in common, while there are certain ideas about loose terrain handling that need to be incorporated as well. A mix of those two basic, general ideas, if you will. The Tamland borrows heavily from my thoughts on this, since Raleigh did actually take my advice on the geometry and incorporated their interpretation of that advice into the Tamland. So, the bottom line is- does it work? Longer answer: While many may disagree on the slacker head angle and lower bottom bracket ideas here, the fact of the matter is that on loose, deeper gravel those ideas incorporated into the Tamland yield a handling that is stable and a lot less scary than most cyclo cross derived bikes used on gravel, or those that are claiming "specific gravel bike geo" and are really just CX geo bikes with big tire clearances. (Niner anyone?) My only nit is that I am left wondering if Raleigh didn't go far enough. What You Don't Get: Looking for that "sports car snap" in your steering? The Tamland isn't your bike then. And besides- why would you want that on a gravel specific bike anyway? Cornering prowess is a different kettle of fish on gravel where a "quick", less stable geometry is going to be more of a handful, not an asset. The Tamland takes turns on pavement in big, lazy arcs unless you really lay it over and drive the front end through the apex of the corner aggressively. It definitely is not a "crit bike"! Don't even look at a Tamland if your bike has to weigh less than 20 pounds. The Tamland is steel, has a heavy steel fork with a 50mm offset, (I haven't seen anything carbon with that long an offset), and it definitely has heft compared to the gossamer light carbon CX rigs you can get. That said, this steel frame is one of the smoothest riding steel frames I have ever ridden on any kind of a bike. I will admit that if Raleigh made a carbon version of this bike, which could be significantly lighter, I would look real hard at the savings account! I've heard guys grouse about "long chain stays" and how they rob a bike of "snappy acceleration". I will admit that in terms of accelerating, I don't understand that statement. Maybe it has to "feel stiffer" to be "faster", and a shorter stayed bike will feel like it is rolling up under your hips when you stomp on the pedals, but that doesn't mean you are accelerating more quickly. It just means you feel something different. Horses for courses, but the Raleigh has longer stays and to my mind it goes as well as any other bike I have when it comes time to giddy-up. On a secondary note- If a bike feels "snappier" under acceleration, it generally is stiffer too. Not something I want too much of in a gravel bike. In my opinion, the Tamland strikes a good balance of stability, comfort, and stiffness. Well, I have changed some things! But since those are components, I won't get into that here. I would maybe try a deeper bottom bracket drop by a few millimeters, and I'd like to try a half a degree slacker head tube angle, but this bike is close. Really close. It has an amazing ride quality due to the frame's tubing and the geometry package is very well suited to gravel road riding on gravel. While that last statement may seem like a silly thing to write, I have heard and seen several comments that seem to be coming from folks that don't understand where this bike, (and other ideas I have suggested which this bike represents), is coming from. If you spend a ton of time riding all sorts of gravel roads, you already know where I am coming from here. If not, well then, maybe this would seem like non-sense then. I get that. On a more specific level with regard to the Tamland, I would have liked to have seen a third water bottle mount. That's the only glaring issue from my point of view that this bike has for a gravel rider. Otherwise, in my opinion, this is the "Warbird-that-should-have-been". A steel framed bike with stability and comfort that fits up to 42mm tires with mud clearance. You can nit pick about the fork material, the over-all weight, and other finer points till the cows come home, but the Tamland Two, as far as I am concerned, comes into the scene as the prototype for gravel road specific geometry in a production bike that is versatile, stable, and smooth riding. Well suited for any sort of gravel road race or riding. Could it be improved? Sure it could, most likely. Does it only do gravel? No- it does dirt single track like a champ, by the way, but it could be a great commuter bike too. I use it in that role a lot as well. Perfect for city riding on rough, pock marked roads. Either way you look at it though, this rig is certainly dialed in for a long gravel road ride. That's just what I plan on doing with it for a long time. Ironically enough, (or maybe not), the B+ idea is being championed by some of the very same folks that pushed the 29"er idea forward and in 1999 produced "The Tire". Mark Slate, WTB's tire designer and mtb pioneer, has a side project called OS Bikes, which many of you long time readers here know about since I own one. Apparently, this new idea will fit my Blackbuck. Guess what I'll be doing later in the year.......? Wow! Was that a great weekend or what Midwesterners? I cannot remember a weekend like this in terms of weather in recent memory. Decent temperatures, low humidity, and while it was a tad breezy, it was one of those "red letter" weekends in terms of what usually happens for weather around here. Saturday was a four hour outing on the bike. I did all of the 3GR route, but I stopped a few times for different reasons. Once to adjust the saddle, once to relieve myself, and another two times for images. Between those stops I hammered maybe a little too hard for the shape I'm in, because I literally destroyed myself out there. I actually came home and after eating, I laid down for about three hours! I was soooo tired. I couldn't stay awake, and my legs were just weak beyond belief after that ride. I got a late start, and I began the ride in a windbreaker since it was cool-ish to begin with and it was breezy out in the open. However; after getting warmed up I decided to pack up the wind breaker and go in my jersey alone, and that ended up being the right choice. Jersey pockets are a wonderful thing, by the way! The gravel was quite varied this time. I saw and rode on everything from fast, smooth hard packed gravel to "normal" conditions, to gravel spread across the entire roadway, and even a bit of "freshie" gravel that was 4 inches deep on a fast down hill section right by Denver. That was sketchy at speed! Speaking of speed, I went and took my son for a bit of a Father-Son time to Iowa Speedway on Sunday. I've been something of a racing fan all my life as I was brought up into the racing scene by my parents who used to drag me around to all the dirt short tracks in Iowa when I was but a wee lad. In fact, my father was a driver for a short time and then worked as a mechanic and pit crew member for another driver for awhile. Anyway, I escaped being a racer somehow and ended up being a cyclist, but I do enjoy watching racers push the limits of speed, so I've been watching racing for many years. Of course, my son ended up wanting to see one of these deals and my Mom, who knew all this, bought me season tickets. Well.......what are ya gonna do? You go to the races! I hadn't attended a race since my late teens or early twenties, I cannot remember, but the sounds were very reminiscent of my youth, and the sights were as well, minus the flying dirt clods and sideways cars. It was fun, and of course the modern race day attendee has a lot more to do and see at the track than we did back in the day, which is great for the times the cars aren't on the track. Anyway, I had a great time, so thank you, Mom! That capped off a great weekend. Hopefully it was awesome where you were at as well! Component parts of a tire. The other day I received a small envelope packed with a bunch of funky fibers and strips of rubber from Challenge Tires. They are most of the component parts of a tire, minus the bead material, which would be made of flexible strands of Kevlar and whatever else they throw in there to make a tire bead! This stuff is the casing materials and tread material. I'll go through what it all is here for you. Starting from the upper left, the hairy looking bunch of strands is the fibers used to make a casing strong enough to resist blowing apart under pressure of the air and helps the tire withstand the blows received while riding. Without these nylon threads, your tire would come apart. Think of this stuff as the foundation of the casing. In this case, these are 60TPI threads. Moving clockwise to the amber looking stuff, this is more nylon thread for casing construction. In this instance, they are 120TPI, the maximum thinness for nylon threads for bicycle tire casings. You can really feel the difference when handling these samples too. The white stuff is 300TPI core spun cotton. Think "Grandmas best table cloth". This is soft, luxurious feeling stuff. The cotton gives high end tires their super cushy, smooth ride feel. This is put together with the nylon threads to construct a high end tire casing. Next up we have the middle, black, shiny looking material. This is 1 ply "green", (non-vulcanized), material which has the nylon threads in it to reinforce it. This is folded two to three times and vulcanized with a tread. And finally, we have the tread strip which the rest is bonded to via vulcanization. Obviously there is a lot of things missing here, such as processes and the aforementioned tire bead, but it is interesting to see and handle these component parts of a tire and know that tires are one of the most important parts of a bicycle. Yesterday I made mention of the Ultegra 11 speed chain ring "upgrade" I made to my Tamland Two, (more on that in a minute), but I've got a couple of other tweaks that I've made as well. First up is the obvious- the Ergon SM-3 saddle. It's white and looks nice on the bike, but the ride is what matters. That will be decided upon later, but this is a saddle I have wanted to try out for awhile. The mtb version is one that agrees with my behind. Hopefully this one should be the same. The seat post was a component I was going to consider swapping out here, and I still may, but for now the groovy little Raleigh branded number on here stays put. The other components here are the WTB Nano 40's which I am running tubed to get a direct comparison with other tires I have been using. So far they are really good. On dirt they are fantastic, but then that shouldn't be any surprise to those who have run Nanoraptors on their mountain bikes. The gravel performance is quite good. Maybe a bit squirrelly in comparison to the Gravel Grinder tires I am also checking out. The tires are very comparable to Clement MSO 40's, but for one thing, and that is on hard packed road and pavement. The Nano 40's knobs deflect just enough that they steal a little bit of energy on pavement or hard dirt. I can tell there is a huge gap in speed in comparison to the Gravel Grinder, which rolls much freer on harder surfaces than the Nano 40's do. Again- that shouldn't be a big surprise. The Gravel Grinder has a diamond file tread, which is very minimalistic, and edge knobs for stability/cornering traction, which do not hit the road unless the terrain is loose, sandy, or muddy. Of course, if you lean the bike over, they will contact the ground as well. Okay, I didn't write anything about this yesterday because I did not have the rings in front of me and I didn't know for certain how they might come apart and reassemble. However; it is apparent to me now that not only is the lack of shaping and machining disappointing on the 46T Ultegra 11 speed ring, but the overall look is simply astoundingly ugly and embarrassing. This goes beyond the color of the metal, this is just a kludge, and a very expensive one at that. Hello! I purchased a bicycle with Ultegra 6800 11 speed parts which was equipped with a "mid-compact" ring set of 52T-36T. Fortunately I was happy to find that Shimano produced a 46T ring for this FC-6800 crankset which suits me more for my style of riding. Thank you for that choice! However; the 46T ring, while fitting the BCD of the crank perfectly, does not at all fit the look of this crankset. The asking price of this ring, which is easily twice that of other rings its size for competing crank sets, is such that I would expect a seamless look with my crank arms. Not this travesty of visual presentation, which is so far removed from the look of the 52T ring as to suggest that the ring could not have possibly been designed for this crank set. May I suggest that it is for reasons exampled by the above- and more- why consumers often have a poor opinion of Shimano cycling products? I cannot fathom how one of Shimano's premier road components could have such poor visual integration which is totally uncharacteristic of Shimano and belies its heritage. There probably will not be a full course recon. I just don't have the resources to do that at this time. I do have a few possibilities for checking out sections of the course, so I hope to be able to get some of it looked at. That said- Riders will be on their own from the standpoint of doing any on-the-fly re-routing. (Which should add to the adventure part.) There is a clause in the Rules that addresses re-routing, (see rule #5 on the TIMP page), so it shouldn't be a big deal. Still.....I hope to check out as much of this course as I can soon. There are two riders pledged to do the course already. Yesterday marked the 46th year since "The Tornado", as we folks who lived through it say. 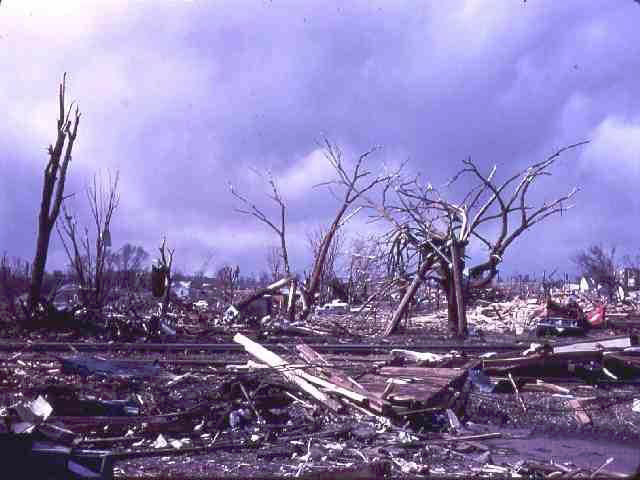 My hometown of Charles City Iowa was devastated by an F-5 tornado a little after 5pm on May 15th, 1968. I was just a little boy at the time, but this event pretty much shaped my life for years to come afterward, and of course, it isn't something one forgets. Thirteen people lost there lives that day, and thousands were injured. Pretty traumatic for anyone let alone a young child to live through. Yet, as they say, good things often come out of tragedy, and I witnessed many a good thing that came out of this calamity. One of those very minor things was my attraction to bicycles. You see, since the tornado ripped apart so many households, bicycles were strewn about the surrounding wild areas where we had the pick of the litter, in a way of speaking, for several years afterward. These bikes we would scavenge, tear apart, assemble, and modify without fear of failure or retribution from someone's parents or the authorities. Apparently Shimano thinks they are Campy. How Much For That Chain Ring In The Window? Okay, so the good news is that my Ultegra 11 speed 46T chain ring has arrived. (Part # coming soon!) That's a good thing, since the 52T ring on there is just not very useful for my preferred gravel riding style. The bad news? Well, apparently Shimano chain rings have a very special.......something. I'm not sure what it is, but the retail price on the 46T chain ring is........get ready for this! Yes- that's for one aluminum chain ring with 46T and a bit of fancy forge work. I didn't order a Campy one by mistake, did I? Nope........it's a Shimano ring alright. That's stunning, discouraging, and seems just plain wrong. Besides the fact that it is uglier than sin, plasticky looking anodized grey/black. If it was beautiful, didn't look like it came off a department store bike, and was......oh say about 100 bucks less at retail, I could swallow that. But this price for this ring is ridiculous. Plain and simple. But.........I will buy it, because there are no alternatives. At some point, there will be other, more reasonable 11 speed compatible options, and this crankset will be replaced so I can afford to keep buying replacement rings. The gravel is not kind to these things, ya know. Good Luck To The Almanzo Riders! By the time you read this, the long course, which is called the Alexander, will have riders on it. The Almanzo 100 and Royal 165 will start Saturday. Should be a great weekend, albeit cool, for riding. Good luck to all those taking part in the events out of Spring Valley this weekend! I dug out the Singular Cycles Buzzard yesterday and aired up the tires for a bit of a runaround to see if I needed to do anything else mechanically to it after my earlier gravel escapades with MG this past late Winter. It seemed to be operating just fine, and the new to me WTB Pure V on this bike is heavenly! Love that saddle on this bike. I hit up some of the downtown urban stuff and the Buzzard basically just laughed it off. I tell ya- this bike is way more capable than the rider! I basically would have to start looking for trouble to get into before the bike would be pushed to its limits and the margin for error would be slim to none with dire consequences for missing it. That's how good this bike is. That said, there is one thing holding it back right now and that is a poor fork for the Velocity Dually/On One tire combination I have on it now. That is the only reason I didn't go to the dirt Wednesday. Lean the bike to the left very hard at all and bzzzzzzzzttttttt! I'm not interested in an unplanned sudden stoppage of fun. So, hopefully a plan for a new fork comes to fruition that will clear the big "half-fats" better. 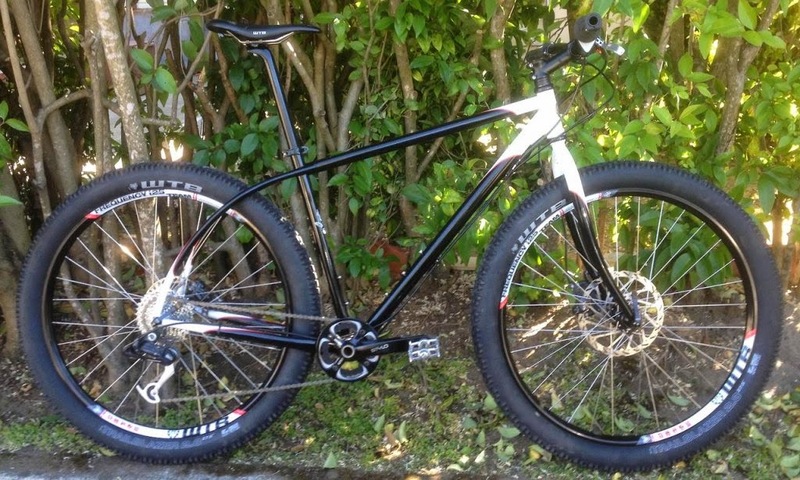 Which brings me to another point- that being that the "new" thing in mountain bikes will be "mid-fat" sized bikes. 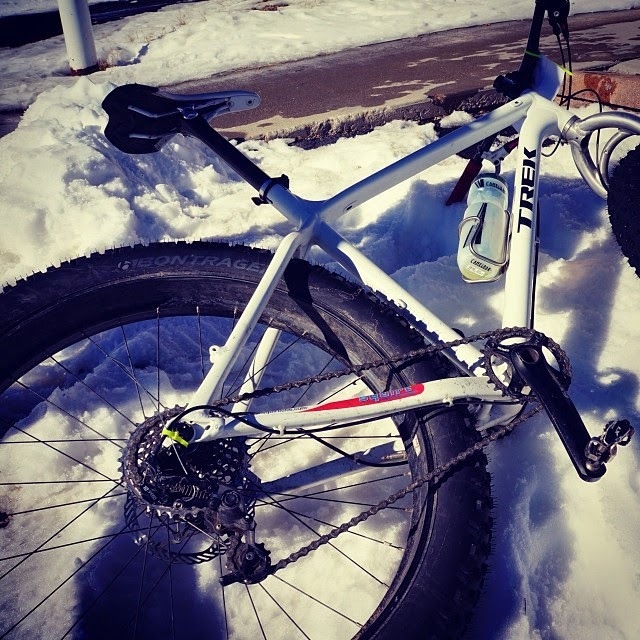 Not true fat bikes, because they are too heavy and cumbersome for many folks. Not 29+ because that requires a totally new rig, and smaller sizes are simply out of the question. So what then? I'm thinking a 584ISO wheel with a 2.8"-3.0" tire, bringing the overall diameter to 29-ish inches is what wiill be the ticket. Why? Because it will fit many current frames, and it gives folks a lighter than 29+ wheel with all the benefits of that size. Or maybe I'm totally nuts. Note: "randomonium" isn't a word, officially- not that I know of. It is a word I use when I don't have a cohesive body of words to throw together for a blog post. You know- like a "miscellaneous" post, or a bunch of tidbits of thoughts, or.....well whatever! Here is today's post! 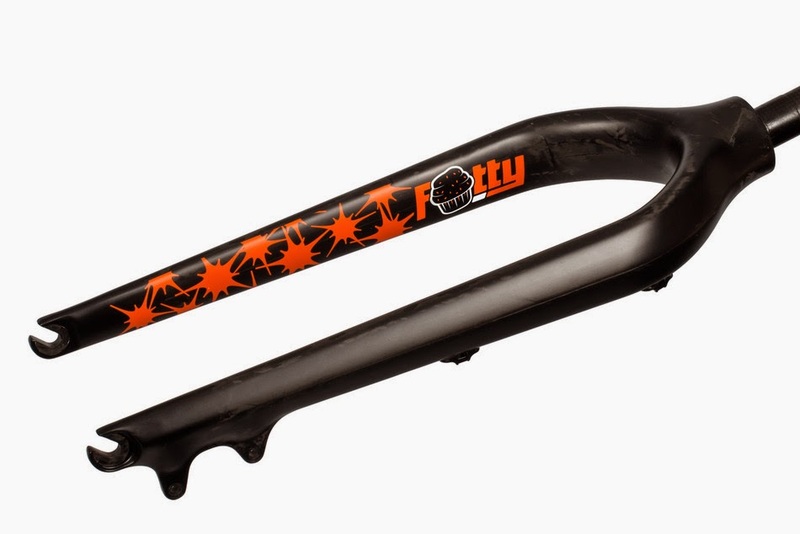 A fat bike fork with less calories. As I hinted back late last Winter, I have plans to upgrade the fat bikes here. The first project is to upgrade the Snow Dog. That's the blue, 2011 Mukluk that was purchased by a consortium of friends for my 50th birthday present. (Yes.....I am a Geezer! 24-7!! ) Anyway, the first bit for that project has been sourced and is coming from the U.K. The Carbon Fatty Fork features a straight 1 1/8th steer tube in carbon and a rear brake standard brake mount, so it will slot right in on my Muluk which has a standard steer tube and the rear brake standard for the front brake. The offset is 55mm and the axle to crown is 470mm. Pretty much spot on to where the Enabler fork is in all regards, except that the Fatty Fork is ridiculously light and is covered in orange bird doo-doo decals with a cartoonish cupcake. Who wouldn't want that? This fits into the fat bike master plan as such: The Snow Dog will become the "all-terrain" fat bike in the stable. It will be the bike I ride in summertime when I ride a fat bike, or whenever 3.8-4.2" tires are appropriate in Winter. The Snow Dog will also be upgraded to a ten speed drive train soon as well. I have other bits and pieces in mind for this rig, so stay tuned for more there. The Ti Muk, or "By-Tor", will be my "expedition" fat bike. I aim to put 90-100mm rims on this rig, probably some funky drive train to clear big ol' tires, and keep it simple. This is going to be the rig I pull out when the snow is deep and I need maximum flotation and traction. I have hubs lined up for it already, and there may be a fork swap on this bike as well. I may be getting my rims later this Summer or early in the Fall, so this upgrade won't happen until the Snow Dog is done first. My Tamland Two is an awesome rig, but as stock it came with a 52T/36T "mid-compact" front gearing set up. That's a problem for where I live and ride. See, here in the Mid-West we have plenty of climbing, but it consists of the short, steep, punchy type of climbing, not the extended up or downhill kind of riding featured in more mountainous areas of the World at large. I find that a close ratio front chain ring set with lower than "he-man racing gears" works great. Just like the 46/36 combo on "Orange Crush". On gravel around here, often times just popping down to that 36 from a 46 is all you need to clean the top of the hill, then you jam back into the 46 and motor on. One shift down, one up, done. 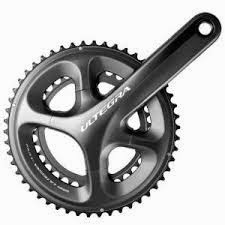 So anyway, that 46T ring is a special little deal on the new Ultegra 11 speed, since it has to matchy-match the flowing lies of the crank, not to mention the special four bolt pattern of the crank spider. The special 3-D shape of that ring certainly does contribute to the exceptional stiffness of the ring, and thus allows for smoother, faster shifting, but this also means there is no other alternative than getting one of these rings from Shimano. Thankfully Shimano saw that cyclo crossers might want the 46T outer and I have one coming from Shimano which should arrive any day now. If Shimnao had not seen the wisdom of doing a 46T, well.......I'd have had to do an entirely different crankset. So while I like the technology and what it does, the availability of options suffers, which stinks. Oh........and by the way, so does the black, plasticky look. Blecch! The route is 100 miles with 7,000' of elevation gain and is 80% dirt. Also available are two shorter course options; 30 miles and 60 miles. The BIG route starts at Lake Davis, located 15 minutes north of Portola, and takes racers on a rolling tour around the lake, up into the surrounding mountains and then sends them through some of the most beautiful and empty alpine valleys California has to offer. Geezer Ride Update: Thanks for the many votes of attendance and kind words about the Geezer Ride idea. I appreciate that and look for updates coming later in the Summer. And......that's enough randomonium for one post. Thanks for reading! It'll be chilly, maybe wet, and ya better bring yer wool! No drop, casual ride pace that may feature several stops for image geekery. Held North of the Amana Colonies and the Iowa River Valley where the views are spectacular and the roads are fun. There will be some tough hills. There will be dead flat parts. Expect to pedal around 40-ish miles or so. There will be dirt roads. You may have to walk in mud. There will be story telling, adult beverages, and food consumed afterward. Sound like fun? Then pencil in October 18th on your plans and I and at least two others have already committed to be there at Amana Iowa where the ride will start kitty-corner from the Casey's Convenience store on Highway 150 where there is a gravel public parking lot. Ride time will be 8:00am sharp. Depending on weather, we may get a bit wet! I'm going to play the exact route by ear. I probably will decide a week or so out based on what the weather may do, and how the water situation lays out. Ideally I would like to reprise most if not all of my experience on these roads recently with some of the Dirty Dog Pack crew. That ride featured some river crossings through "low water" areas but if the river is too high, I won't make us go that way. Getting a little wet is one thing, getting soaked is quite another! Anyway, however the route goes, the plan is to do a fun 40-ish miles then return to the Amana village for some brews and food before bailing out back home. It should be a good time. I'll have more on this event as time draws near, but for now I'll be focusing on some other upcoming events I have on my plate and we'll get back to this come late Summer and pick up where we left off here. Suggestions? Concerns? Comments? You know where to leave them. Thanks for considering the Geezer Ride! Saturday I got out for a morning ride. As it was supposed to be windy from the Southeast, the plan was to go South and East on the grid of gravel roads South of Waterloo. The Sun was up and the skies looked okay starting out. The temperature was in the upper 40's but it was supposed to climb quickly to the 70's within a couple hours of my start. The ride Southeast out of town on the bike path was pleasant as the path is mostly shielded from the wind by brush and low trees. Many songbirds make this strip of vegetation home now and I spied my first Goldfinches of the season while headed out to the countryside. I reached my jumping off point and hit the gravel. The wind was pretty stiff. I'd say it was around 20mph to start out with some slightly higher gusts. It was enough to make the rollers a hard grind, for sure. Not only that, but Black Hawk County hasn't been idle and there was several stretches of fresh gravel to slog through as well. The upside was that the temperatures were indeed rising, the scenery was great with all the freshly planted fields, and the aroma of freshly turned soil in the air. Definitely a Springtime in Iowa ride! The skies darkened whilst I was out there! Of course, the Springtime also brings occasional showers, and this day was no exception. I could see the gathering clouds. My marvel of post-modern technology, the iPhone, showed me the weather radar and I determined that I'd probably be okay since my route was taking me around the rain clouds, mostly, and I also had my packable rain jacket, just in case. With that bit of insurance I motored onwards down new-to-me gravel in search of the Tama County line where I would make my turn back towards home. The wind was making that quest quite a workout, and speeds were not all that high, but I was moving and I wasn't tired......yet! Of course, I haven't been on my game since Trans Iowa happened and I didn't know when, or even if, I was going to run out of gas. Added to this was the fact that I was experimenting with riding on a light breakfast of two Clif Bars instead of my regular fare. I was definitely committed to the strategy as I brought three water bottles with two having electrolytes in them and one gel packet. If I bonked, I was going to be in trouble, but typically I ride well on a more empty stomach than on a full breakfast of any sort. Stop to swap out water bottles. I didn't get very many images since the demise of my Fuji means that I am now packing my Panasonic LX-3 which isn't a very friendly "shoot-while-you-ride" camera. Especially since I am pretty vigilant about using the lens cap when it isn't in use. I've got my eye on this camera as a replacement for the Fuji which should rectify that situation and allow me more freedom to shoot from the saddle again. So there were only images from my two brief stops. I passed a few choice barns, so this route will have to be revisited! Eventually I ran into the pahas of Hickory Hills and turned West. I noted that my return trip may not feature the hoped for tailwinds to push me. The wind strength had become more varied, and lessened than when I had started. Going North I was working a lot less though, so apparently there was still some benefits left to getting going in the opposite direction! Along about twenty minutes later I ran into sprinkles. I stopped at a right turn briefly to assess whether or not to grab the rain jacket. I didn't think it would be necessary, and in the end that proved out to be correct. The rest of the journey in was uneventful. I turned in almost 3.5 hours of riding which I was pleased with. The bonus was that I wasn't dead or really wasted when I got back. The single gel was enough, and I felt pretty okay on Sunday as well. I am not sure if I've actually figured something out, was lucky, or if I am all the way back from the hit of Trans Iowa, but it was a good ride for a change More "normal" than not, which is progress. I'll take it. Hey, it's Mothers Day here and I wanted to wish my Mom, (who reads this blog, amazingly enough! ), a Happy Mothers Day. And to my wife, thanks for being an excellent Mother to our two children. Finally, to all you Mothers that may read this, I wish you all a great day. Thanks for what you do and for what you mean to your children. I chose this image because my Mom grew up on a farm and I thought she might like this barn. Its on a road I hadn't ridden on before Saturday, and I'll have the story on that tomorrow. Okay, I get blamed for making up these super tough routes all the time. Folks seem to like them, but I was reminded recently that not everyone wants or needs a beat-down of a ride. So, I've come up an idea for something a bit more chill if you might be interested in doing a shorter, no-drop ride. Here's the loose details: Approximately 40-ish miles of remote, beautiful, wooded territory in Iowa and Johnson Counties. Casual pace, food and drink afterward, (or maybe during the ride? ), lots of stopping for photo ops. The date will likely be mid-October. That's hopefully when the leaves will be in high color. This route will feature some climbing and some dead flat roads with a sprinkling of pavement. The route will feature parts of Trans Iowa courses and the B Maintenance road shown at the left here will also be part of that loop. There may be another dirt road section or two as well. I've ridden much of what I want to use for this ride and the final route choice will be determined by weather conditions. My vision for this is to have the ride happen on a Saturday morning. At a casual pace, it should be no problem getting done by noon/early afternoon. Then I was thinking there should be a lunch and beverages stop for those that want to hang out, and then everyone could bug out late Saturday afternoon. Prototype Bonty tires and rims. Looking ahead to the Fall, there are going to be a slew of new fat bike components and bikes coming out. I've spoken about Trek's plans before here, and now I've heard a bit more about that. In fact, the shop where I work will be getting in two new models of Farley fat bikes, one with a Bluto front suspension fork and Bontrager tubeless ready fat bike tires on Sun Ringle' manufactured fat bike rims which also will be tubeless ready. There will be demo bikes at most Trek dealers, (including the shop where I work), for prospective buyers to try out the new rigs. Furthermore; it has been confirmed to me that Trek will have these rims and tires in supply for aftermarket sales. I've no idea what the pricing will be, but that may be information that isn't set in stone just yet. This is kind of a big deal in the fat bike world because it is going to put some of the established companies on notice that their non-tubeless, high priced merchandise needs to be retired in favor of some better priced, tubeless ready stuff. I just can't see 150 dollar plus tires and rims that are not tubeless ready surviving sub 100 dollar tires and tubeless ready rims from the new players in the game. Oh.......and I heard Trek is working on a 29+ bike. So there is that as well. Think about tires and rims with regard to that development. It's going to change things up. This should get interesting. My friends in SoCal took on a challenge to see if the revolution in 27.5" wheels was better, worse, or just different than 29"ers recently when they did this review for Twenty Nine Inches. (Disclaimer: I had nothing at all to do with the testing or findings reported on in that review.) They put identical Scott bikes, with the only difference being wheel size, to the test on their backyard trails and found pretty much what I've said all along about 27.5 inch sized mountain bike wheels. Mainly that they are not the "best of both worlds", (meaning traits of 26 inch and 29 inch), and really, how could they be? I heard it said that basically one has to think about 27.5 as a "better 26"er". That's pretty much spot on. So, essentially you can look at the "revolution" of the 27.5"/650B wheel as a lateral move based mostly on marketing to make the old somewhat better and somewhat new. Not that there is anything wrong with 27.5"ers, but it isn't what many had said it was/would be in 2007 when the 27.5"ers hit the airwaves. The hyperbole surrounding the introduction of this wheel size was really not correct. That said, there is a place for smaller sized mtb wheels, be they 559ISO or 584ISO based hoops. Smaller statured folk, big, ungainly traveled suspension bikes built to be pinged down mountain sides, and really......just to have a different flavor, it's all good, but I still think it is funny how 26"er stuff is disappearing fast, which when you stop to consider it, makes a point about the necessity of having both 26 and 27.5 around as choices. Obviously, manufacturers, at least, are saying you don't need that, and the findings of my friends in SoCal seem to say similar things. A few things come to mind with regard to this image of Jay Barre from Trans Iowa V10. First off is that Jay Barre is moving from Illinois to California and his going away party is soon. Wish I could be there to wish him well! Secondly, this may be the most popular image I have ever posted. It's been shared numerous times and I keep seeing it pop up all over. I am not much of a photographer when it comes to a comparison of some of my friends who are excellent, but I guess I captured "something" that resonates with a lot of folks here. Of course, the feat behind it is compelling, so there is that! The Feat: Yes, Jay Barre did the toughest Trans Iowa ever fixed gear and rode 336 miles in just under 34 hours straight. But that's just the tip of the iceberg, as it were. You see, whenever I think about Jay, I think about that heartbreaking scene in "300 Miles Of Gravel" where Jay missed Checkpoint #1 by two minutes and was DQ'ed. The look on his face gets me every time when I see that scene even now. Well, Jay came back in V8 and finished the course on a geared bike. Then in V9 he did it on a single speed freewheel set up, and now, in V10, on a fixed gear. That's never been done like that. Good luck Jay on your move to California! And that's a wrap on today's news and views. Keep the rubber side down and go have an adventure on your bike! Since I am a family man and work at a bicycle shop as well, I don't get out to play after work like a lot of folks do. I usually end up going out at odd times and I end up getting the woods to myself, more often than not. Such was the case again yesterday, which was my first proper dirt ride of 2014. That previously much mentioned event I was ranting on and on about here sort of took precedence over any extra-curricular bicycle jaunts this Spring! Anyway, I had the WTB Nineline 2.25"ers to be riding, so I rode the Milwaukee Bikes single speed and tried them out. Obviously, with dry, hard packed trail, these tires rolled super fast, but almost any tire would in these conditions. That said, I tried to get back into the rhythm of single speed off road riding. It's been a little while since I've done any of that! The underbrush is still just getting going and tiny flowers were studded into the green carpet of the forest floor. With leaves just barely poking out of buds on the tree limbs, it made for an odd juxtaposition of bare trees against the quickly spreading greenery on the surface. The views are still wide open, so spotting the deer flitting from ravine to ravine was easy to do. Most animals were silent or the forest was empty other than the few young deer I saw. In fact, at one point I almost hit a young deer as it came from behind a tree I was about to pass by. It probably was born last Spring, judging by the size of it, and the tree was just big enough to obscure it from my view until the deer spooked and leapt out from its hiding place to run away. That's definitely the closest deer encounter I've experienced at Ingawanis Woodlands. I'm surprised it took this long to happen, actually. Well, I did my ride and then noticed that the tread was packed in with dirt. Rather than import that mess home with me, I decided to ride down the gravel road a bit to clear the tires out. As I went Westward I thought about investigating the dead end of the road I was on. I knew that at one time there was a bridge across the Cedar River on this road but that it was now truncated at the river due to what I believed was the lack of any bridge being there at all. However; when I reached the faded, decayed barricades, I saw that I was in error with that thought. The old bridge is still there, accessible by foot from the East bank, but not by the West side. I have seen a lot of bridges in Iowa, but never one remotely close to the design of this structure. The pylons looked to be cement filled iron or steel and the double arch design was decked with big, thick wooden planks that were rotting and some covered in moss. This bridge is an old one! I marveled at the fact that it should even still exist, given its decayed state, and even more so since it has survived some wicked floods in the past 20 years. It certainly is not long for this world, seeing how decayed the deck is now and that it is obvious no one is maintaining it. Such a shame! It could be one of the coolest bridges in Iowa, as far as I can tell. Glad I got to see it at all. Well, I got my tires cleaned out and headed home, once again proving that you just never know what you might find if you poke around in the rural back country! While all the T.I.V10 recap was unfolding here, I wasn't idle. I was off the Monday afterward and pretty much was incapacitated by weariness, but I fully expected that. I did go out on my rat ride fixed gear to pick up my son from school though, so I got a short bike ride in! The weather was cold, dreary, and wet for almost the entire week. Not conducive to riding or for business at work. That played to my recovery in a good way, since it was easier at work than it could have been and I didn't feel guilty for missing out on great days for riding since there were none. It was an excellent week for tires though, and I have gotten in two sets of the latest shoes dubbed "gravel road" worthy for Gravel Grinder News testing. In fact, one is called the "Gravel Grinder" and is by Challenge Tires. This isn't like the hand made, glued up variety, but is a fully vulcanized casing like most tires are made. It is dubbed a 38mm tire from Challenge's "Race Series" and has a file tread center with outer lateral lugs deigned to enhance stability and cornering on dirt roads. The other tires I got were the WTB Nano 40's. Obviously a downsized version of the acclaimed Nanoraptor tread pattern on a tall "C" shaped casing. A center line is there to make a fast tire. We'll see how fast when I get more time on this one. I got both sets mounted and in a minor miracle of sorts, both measured out as claimed. Weird. That almost never happens with the mountain bike tires I get. 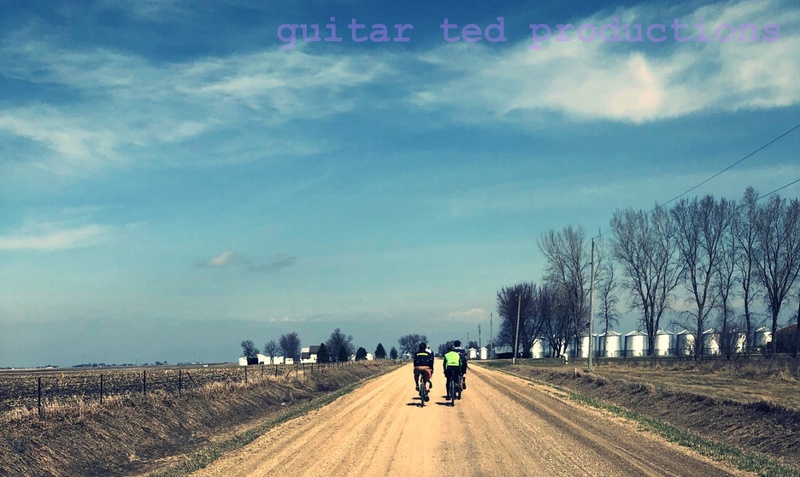 I have ridden the Nano 40's around town here but not yet on a proper gravel ride since it has been so wet up until just recently, but I have actually gotten in a decently long gravel ride on the "Gravel Grinder" with some friends down near Amana last weekend. In fact, we started out of Amana, went East and North, then South across the Iowa River and then back West and North again to close out the loop. One of the guys I rode with, Craig had won a set of HED Ardennes+ wheels by being the last person in to Checkpoint #2 at Trans Iowa, and I figured I would hand deliver them. As long as I was coming down, why not ride? So that's how I ended up riding down there, and Charles came along as well. It was a great adventure for sure! See the chunky gravel under Craig's feet? Much of our route was covered in that. 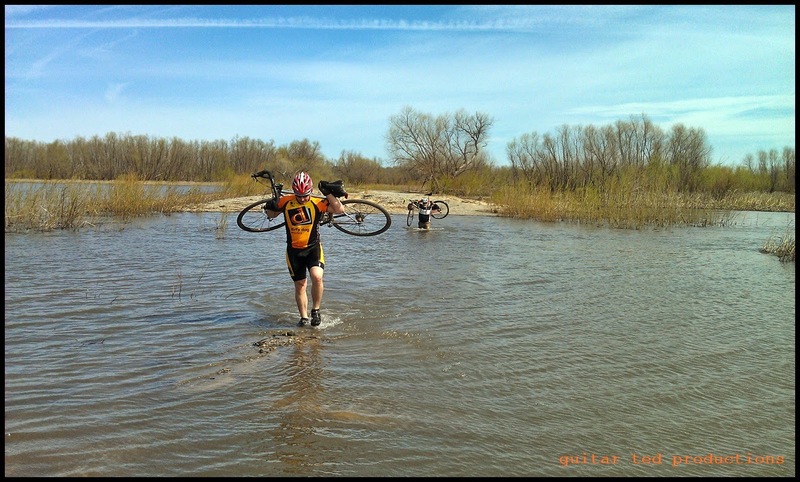 There were some "water crossings"! When I came down to Amana I noticed "festival" signs everywhere and a large amount of traffic. When we finished the ride Amana was jam-packed with folks attending the annual "Maifest" celebration. This made finding a bite to eat easier, as there were vendors all over the small village. We parked in front of Millstream Brewing where there were bratwursts and, of course, Millstream Beer to be had. Charles, Craig, and I all had good food and drink with some very good, (and at times, deep), conversations. It was a great day to be out and having it fall on Maifest was just pure dumb luck that only added to the fun of the day. The end of the weekend was a rest day. Having my legs ripped off by Charles and Craig made me really tired again, like I had been after Trans Iowa. That dictated that I take it easy, or I feared I would be running myself into the ground, which would only end in bad things! I did a bit of bicycle maintenance, catched up on some writing, and hung out with the family instead. Outside it has transitioned from cold, dreary, and wet to warm, green, and Summer-like. Time to get busy and train up for Odin's Revenge, get the Trans Iowa Master's Program dialed, and do some recon for the GTDRI route. It's going to be a very busy May! That's what has been going on and what will be going on in the short term here at Guitar Ted Productions. Thanks for putting up with all the Trans Iowa madness over the past few weeks. Trans Iowa V10: The Fireworks Begin!